Jean Beliveau died on Dec. 2 at the age of 83, following a stroke. 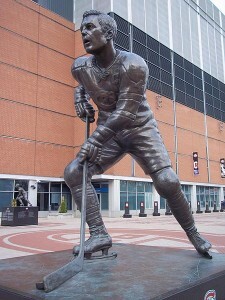 From the early 1950s until 1971 he played with the Montreal Canadiens hockey team. The popular English nickname for Canadiens is the Habs, short for Les Habitants. The Canadiens play their games at the Bell Centre in Montreal. Beliveau was the captain of the Canadiens for 10 seasons. During his hockey career, he helped his team win the Stanley Cup 10 times. To say he was loved by his fans is a vast understatement. And in return, he loved his fans, always taking time to sign autographs and do what he could for everyone he knew. He was known as a man who had grace and class. “He was not only a great athlete and player, he was a great man, a great Quebecer, and a great Canadian,” Quebec Premier Philippe Couillard said in an article on the NHL’s website. He was given many honours, including being named a Member of the Order of Canada and having his name on Canada’s Walk of Fame. In 2009 he was given an NHL Lifetime Achievement Award. The mayor of Quebec City, where Beliveau played hockey for the Quebec Aces before he joined the NHL, has suggested that the city’s Coliseum Avenue should be renamed in Jean Beliveau’s honour. Beliveau’s funeral will be held in Montreal today (Wednesday); Prime Minister Stephen Harper and other dignitaries are expected to attend. Jean Beliveau was the captain of the Montreal Canadiens for a decade. What qualities and characteristics does the captain of a team possess? What might this tell us about Jean Beliveau? Reread this paragraph. Have a conversation with a classmate about whether or not you think this paragraph should be included, how it adds and/or takes away from the topic of the article, and if there may be another way you might have presented these facts. In other words, analyse this specific paragraph and why it works or doesn’t. Identify specific elements of texts and explain how they contribute to the meaning of the texts (OME, Reading: 1.7). Analyse texts and explain how various elements in them contribute to meaning (OME, Reading: 1.7). analyse a variety of texts, both simple and complex, and explain how the different elements in them contribute to meaning and influence the reader’s reaction (OME, Reading: 1.7). The Montreal Canadiens have many nicknames and, being from Quebec, many of those names are French. For example, the Canadiens are also known as: Le Bleu-Blanc-Rouge (Blue-White-Red) and Les Glorieux (The Glorious). What are some of the most inventive and creative nicknames that have you given to a friend or family member?